The future of music application is here with Google Play Music APK 6.12.3217E.3150412. As a part of Google applications for your Android device, it is online radio music for your Android device. This application is also used as a music player, and you can save up to 50,000 of your favorite music there. The stored songs will be available for you to play anytime across the boundaries of Android device, iOS, and web browser. This app has more surprises for you to witness. The radio feature of Google Play Music contains millions of songs and music around the world and you can choose them according to the date, album, artist, or the title. Once you’ve gotten used to it, Google Play Music will automatically recommend you with many songs and music that suit your taste. This smart feature will bring more comfort as you update the newest songs from your favorite criteria. Google Play Music is also free from the start, and you will get a pleasant experience of listening to the music without the interference of advertisement. Smooth buffering of the music will also add more comfort to your music experience. Although this application is free from the start, you can subscribe to gain access to many other songs. By doing so, you will also be able to download the songs even if you’re disconnected from the internet. An interesting feature of Google Play Music allows you to make a small circle of your close friends, families, or dearly beloved one. This enables you to share the excitement of your app with the others. Of course, such feature can only be gained once you’re subscribed with membership. One more advantage as a paying member allows you to gain access to YouTube Red, where you can watch music videos without any advertisement to annoy you. 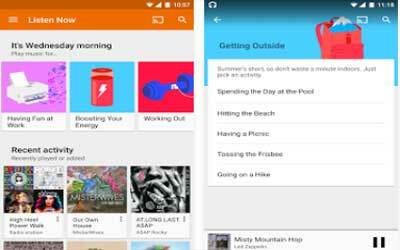 Google Play Music for Android is the perfect, smart music application for you.